Hey there! This is Brian from This Cookin’ Dad with a great tip on how to save yourself a little money during those weekday lunches, but still feel like you are getting that eating out experience. Takeout containers are easy to buy online and my Chicken and Spinach Tortellini Soup is the perfect thing to fill them! This may contain affiliate links. Please only purchase if you will get value from the item. Who doesn’t love a great big bowl of soup? No matter how your day is going, a hot cup of soup will warm your soul and just make everything feel better. It’s always tempting to head to the local takeout spot a grab a bowl for lunch, but I am just amazed at how much it costs to buy that little plastic bowl when a great soup is so easy to make at home. 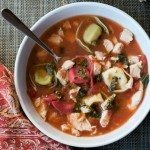 A few simple ingredients is all you need to make a warm, comforting bowl of Chicken and Spinach Tortellini Soup for a quick weeknight dinner or an easy workplace lunch. 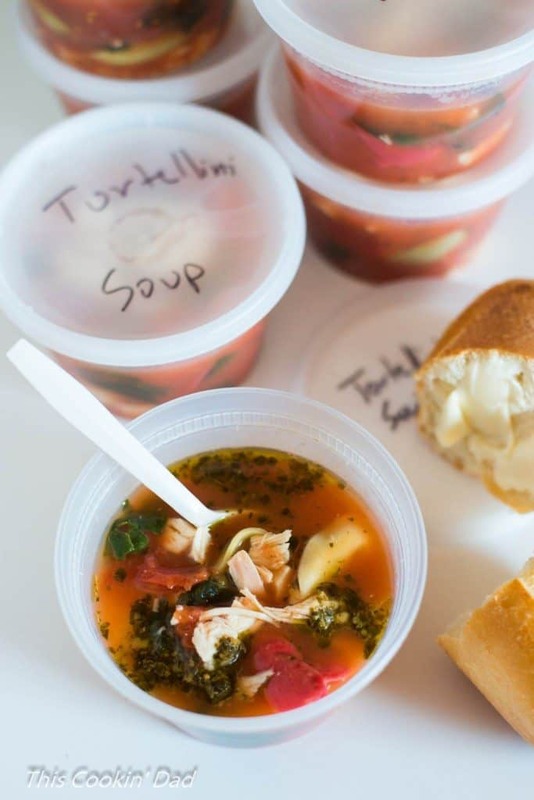 Poured into takeout containers, those leftovers could quickly become the talk of the office with everyone wondering what new spot you’ve found for a delicious cup of soup to make the day pass a little easier. And making it couldn’t be simpler! 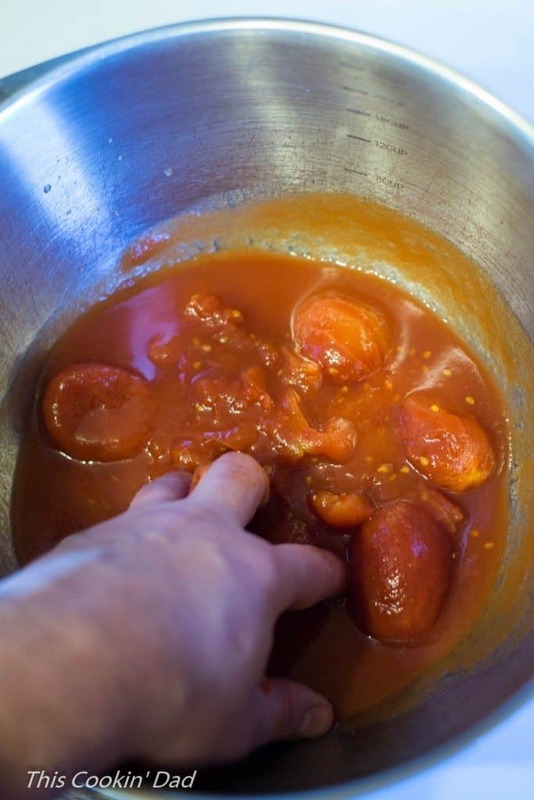 I start by hand crushing a can of whole, peeled tomatoes. Next, I measure out 2-3 cups of pre-made tortellini from your grocer’s refrigerated aisle. Then I combine the tortellini and tomatoes with 4 cups of simmering chicken broth and a cup of hand-torn spinach leaves. I bring it all to a boil for 2-3 minutes or until the tortellini are tender. While that’s working, I start chopping up some precooked chicken breast. 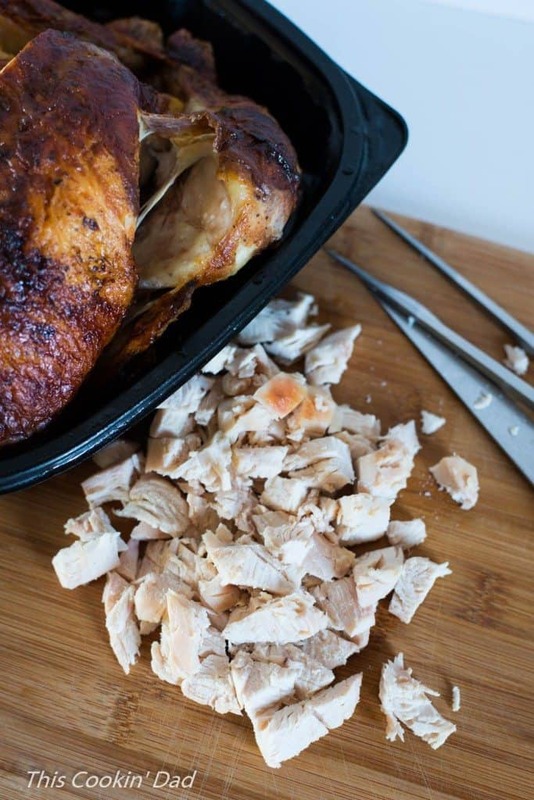 I’m using a rotisserie chicken here to make my life a little easier. Sometimes you just need a break, right? 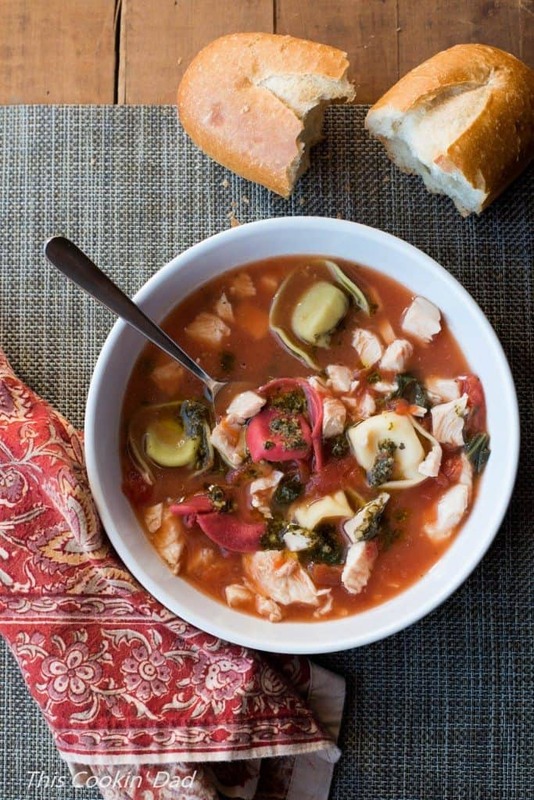 I toss some chicken into a bowl, ladle over my spinach and tortellini soup, top with some pesto (made from your favorite recipe or the convenience of the jarred stuff) and grab a nice crusty roll for sopping. Weeknight meals just don’t get any easier. 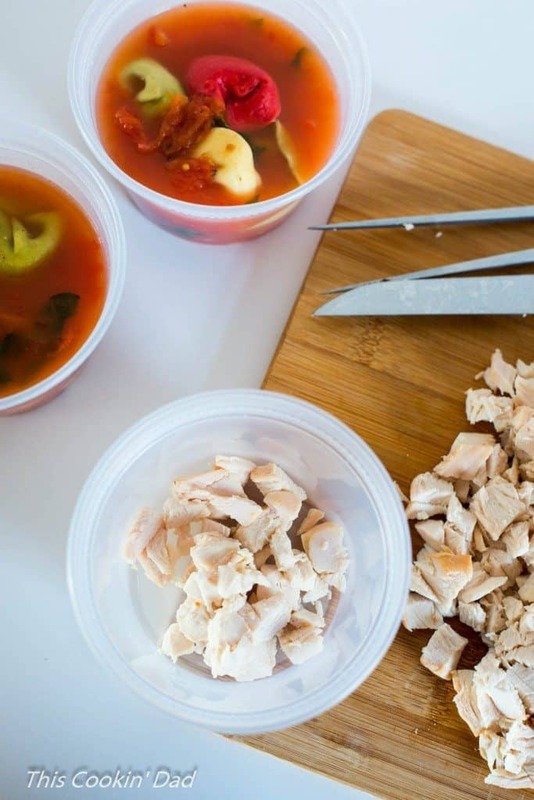 If I’m packaging my soup for weekday lunches, I start by putting about 3 tablespoons of chopped or shredded chicken into a 16 oz container. Then, I fill the cup most of the way with soup and tortellini, dividing into approximately 6 equal portions. To finish, top with that pesto, cover with a lid, label it, and stash in the fridge. The next day, just warm in the microwave for a minute or two and grab a crusty roll. I, for one, grab a plastic spoon as well. It makes me feel like I got to sneak away for a bit instead of munching on leftovers. A quick and flavorful soup that is the perfect way to save you time and money on weekday lunches. In a 3.5 quart pot, heat chicken broth to a simmer. Add the crushed tomatoes and bring to a boil. 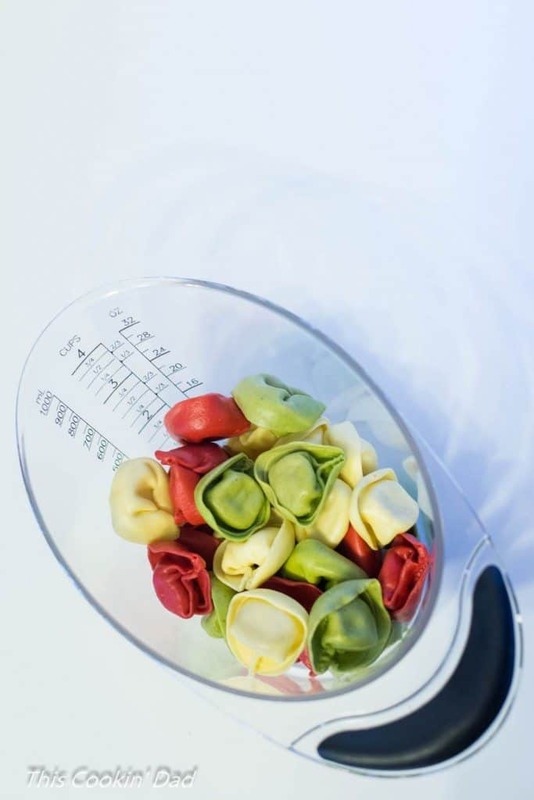 Add in the tortellini, reduce heat to a low boil, and cook for 2-3 minutes or until tortellini are tender. Add spinach, seasoning, and salt and pepper. Gently stir to combine and remove from the heat. Divide the chicken into six equal servings, place into six serving bowls or takeout containers and ladle in the soup. Top with pesto and serve with crusty bread. Enjoy! Looking for other soup options for your takeout containers? Try one of my the recipes over on This Cookin’ Dad. 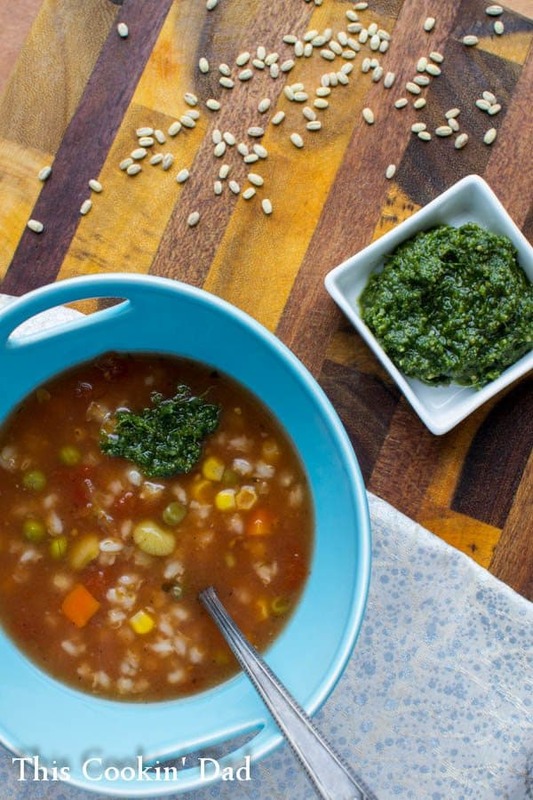 How about a Slow Cooker Vegetable Barley Soup with Carrot Top Pesto? Maybe that Carrot Top Pesto could be the one that you use for your Chicken and Spinach Tortellini Soup! 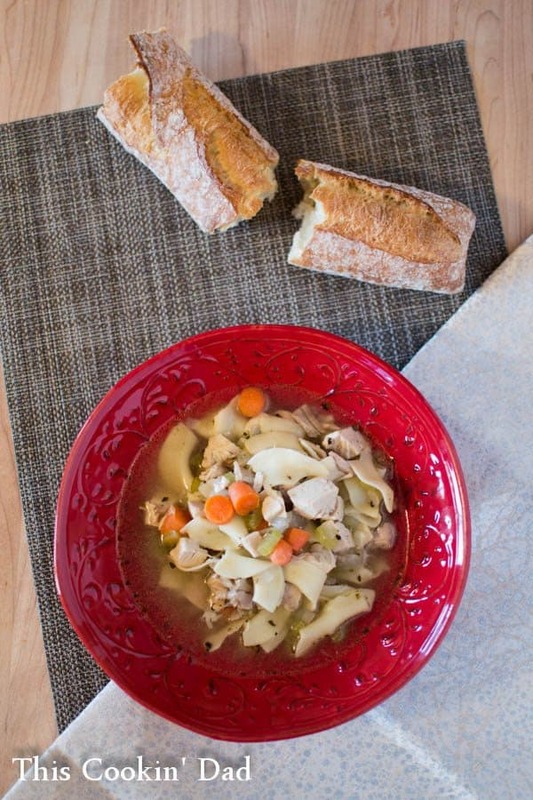 Maybe you’d prefer a Simple Chicken Noodle Soup. This one is so easy that my 9 year old can make it! 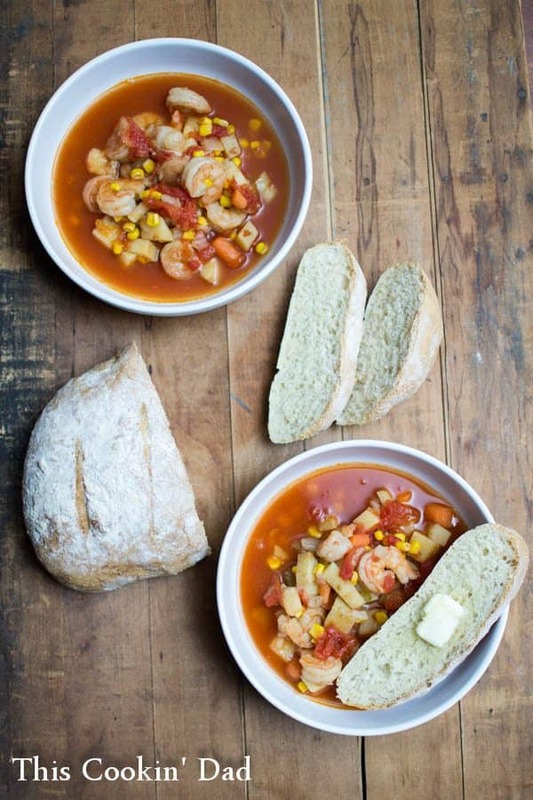 If you’d like something a little more regional, try my Manhattan Shrimp Chowder. 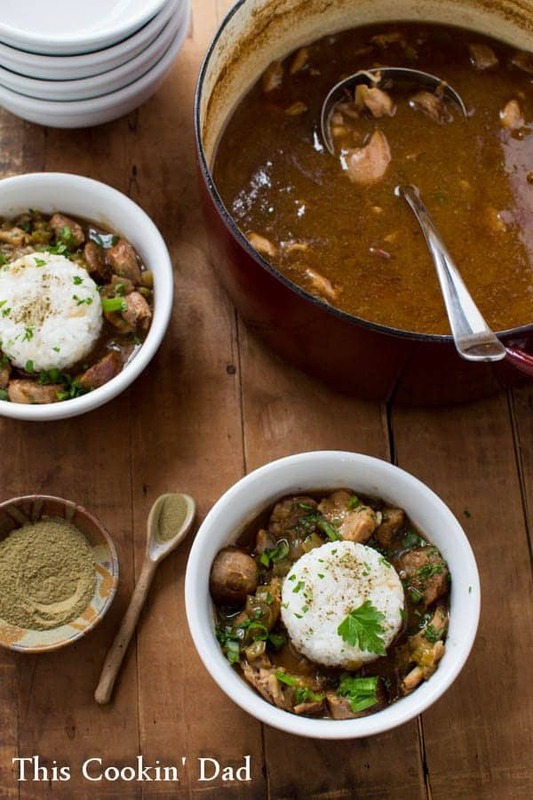 My personal favorite is my Chicken, Sausage, and Shrimp Gumbo. It’s my life and my heritage in a bowl! I know that you’ll love any of these and I hope that you give them all a try! Spend a weekend making soup, fill up your takeout containers, and stash them in the freezer for a yummy, comforting alternative to the daily trip out for lunch. What’s your favorite way to do takeout? 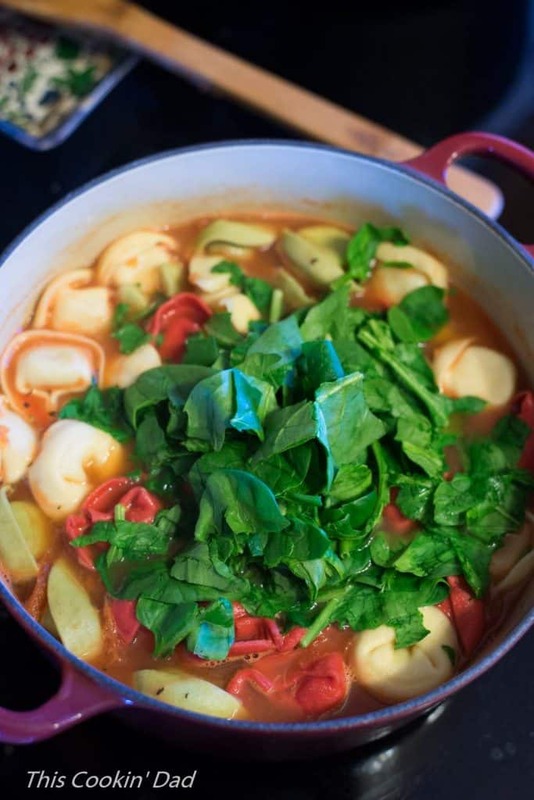 Leave a comment and share how soup can shake up your lunchtime routine.